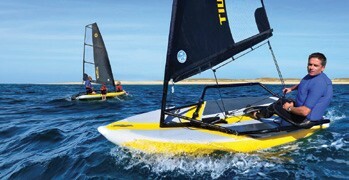 The winner of the Best Innovation category in Sailing World’s 2014 Boat of the Year awards, the Tiwal 3.2 is the world’s first high performance inflatable sailing dinghy. Designed for sailors who want a fun-to-sail boat without the hassles of trailering, cartopping, maintenance and storage, the 10.5-foot (3.2 meters), 111-pound boat can be inflated, rigged and launched in under 20 minutes, and stores neatly in two bags. The Tiwal 3.2’s hull is built with the same tough PVC material as rigid inflatable powerboats, and its wide, V-shaped underbody delivers quick acceleration, easy planing, and comfortable stability. The boomless rig is available with either a 56- or 75-square foot sail, each built by North Sails. The MSRP (with the smaller sail) is $5,950. Tiwal USA is currently looking for dealers. For more information, call 888-683-5880, email tiwalusa@tiwal.com or visit tiwal.com.